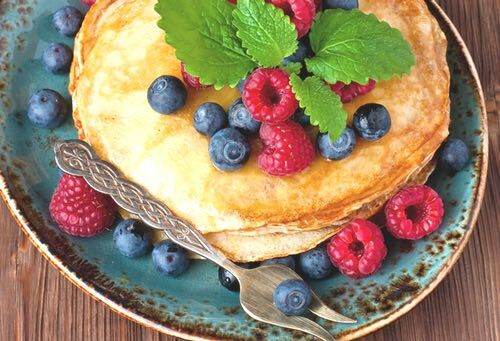 Thanks to Grandma's homemade pancake recipes, you'll enjoy a variety of old fashioned pancakes and toppings. There's nothing like a hearty stack of pancakes to brighten the day. And for something truly special, be sure to make Queen Elizabeth's drop scones, also known as Scotch pancakes. They are really quite easy to make, and they have a delicious Old Country flavor. Every family has its pancake day and when it comes only once in six weeks it is really a special event. 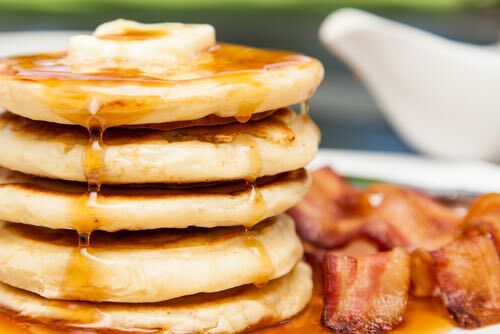 Some households serve pancakes every other day at breakfast as well as on special occasions. For those less accustomed to the art of pancake making, there are a few rules that should be kept in mind. First, it is important to sift the flour and salt, or lift it and let it trickle through the fingers two or three times to aerate it. Do not beat the eggs, but put them straight into a hollow in the center of the flour with a little milk, and gradually work in the flour from the sides, adding a little more milk by degrees. But, never make the batter too moist at first, or it is almost impossible to beat the lumps out of the flour. Beat until the batter is full of air bubbles then add the rest of the milk gradually. All batters must stand for at least an hour to allow the starch grains in the flour to swell and soften. For thin, English-style crepes, choose a perfectly clean, small frying or omelet pan, put in a little lard, dripping, or butter, make it hot, pour it away, and wipe the pan out with soft paper. 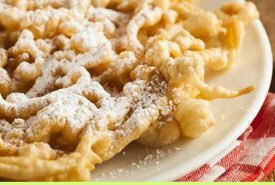 When ready to fry the pancakes, put in a piece of lard, or butter, the size of a walnut, make it hot, stir the batter, and take up 4 tablespoonfuls (1/4 cup) and pour it quickly into the pan. Allow it to run all over the pan, and when set, and pale brown on one site, slip a knife round the edges of the pancake, and toss or turn it over, and let it brown the other side. When cooked, turn pancake onto a sugared paper, sprinkle with squeezed lemon juice and sugar, roll up, and keep hot while the rest of the batter is fried in the same manner. Add fresh lard to the pan for each pancake. A useful batter is made with 2 eggs, 1 pint of milk, 1/2 pound of flour, and a pinch of salt. This can be made richer by adding more eggs and less milk, or by adding cream. Plain batter is made by adding a teaspoonful of baking powder to the flour, and an ounce of oiled butter, 1 pint of milk, and no eggs. Oiled Butter: Put two ounces of fresh butter in a saucepan, so it melts gradually, until it becomes an oil; then pour it off carefully from the residue. Spread a little warmed jam in each pancake before rolling it. Fruit stewed with sugar until stiff, like a marmalade, may also be spread on the pancake before rolling it. Orange juice may sprinkled to replace lemon juice. Serve your homemade crepes unrolled with a sprinkle of lemon juice and sugar and topped with fresh berries in season. Mix batter as usual. Beat the whites of the 3 eggs and stir in slowly last thing before baking. Beating the egg whites makes the pancakes fluffier. Beat eggs in large bowl, then add milk, oil. Sift together flour, sugar, baking powder, salt, then add to liquid mixture and beat until smooth. 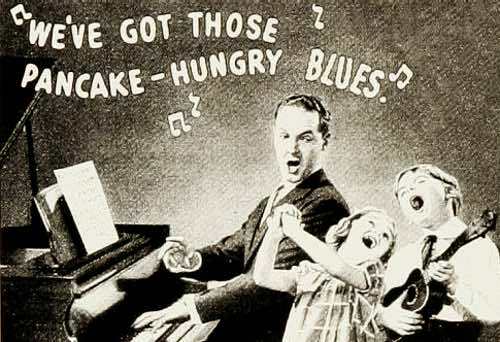 Bake pancakes on a hot griddle or pan until bubbles form, then turn over and bake on the other side until golden brown. Serve hot with syrup. 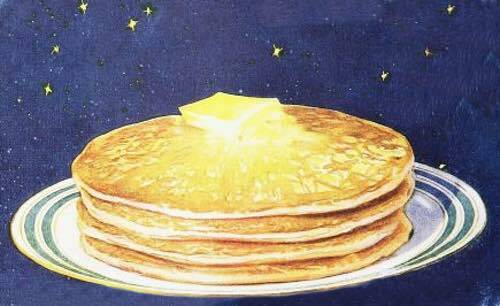 For this homemade pancake recipe, make as for Golden Pancakes (above), but separating the eggs. Use egg yolks in the batter instead of whole eggs. Fold in about 2 cups grated unpeeled apples. Beat egg whites stiff and fold in last. Bake as usual. Serve hot pancakes sprinkled with cinnamon syrup, or drizzled with spiced honey, or your favorite syrup. Bring to a boil 1 cup brown sugar, 1 cup water, and 1/2 teaspoon cinnamon in a saucepan. Boil hard for about 10 minutes, until syrupy, then stir in 1 tablespoon butter. Delicious when served with apple pancakes. Heat 1 cup liquid honey and 1/2 teaspoon mace in a small saucepan, then stir in 1 teaspoon soft butter. Mix 3 heaped tablespoonfuls of self-raising flour with a pinch of salt, 1 teaspoonful of ground ginger, 1 well-beaten egg, and sufficient milk and water (in equal quantities) to make a smooth batter, and, lastly, some well chopped crystallized ginger chips. Fry in very hot lard until a rich brown color. Place on a hot dish, and spread each pancake with lemon curd as soon as cooked. These are delicious! It makes an excellent change from the usual homemade pancake recipes. Mix ingredients into a batter and fry pancakes on a hot pan or griddle. Mix 1/3 cup chopped nuts with 1 cup prepared pancake flour and 1 cup sweet milk or water. Stir until smooth. Bake on hot, greased griddle until surface is covered with bubbles; then turn and bake on other side. Pour hot milk over bread crumbs and let stand until cool. Beat egg yolks in small bowl until thick and lemon colored, then stir into milk mixture. Sift flour, baking powder, and salt together, add to batter mix. Stir in melted butter. Beat egg whites stiff, then fold gently into batter. Bake on hot greased griddle or pan. Serve with syrup, honey, or jelly. This homemade pancake recipe makes about 40 small pancakes. Butter pancakes, sprinkle with powdered sugar and add a few drops of lemon juice. Maple syrup or brown sugar syrup with a big pat of butter on top. Sprinkle grated cheese over piping hot pancakes. The cheese will melt and give delightful flavor to the pancakes. Serve generously topped with your favorite fruit jelly. Serve buttered pancakes with sweetened crushed strawberries, raspberries, or blackberries. Fruit sauces and jams make a nice variation for pancakes, sauces such as apple, cherry, pineapple, raisin, rhubarb, or peach. Drop scones are also known in the U.K. as Scotch Pancakes. They are similar to the North American pancake, but they are usually made thicker and a wee bit smaller. 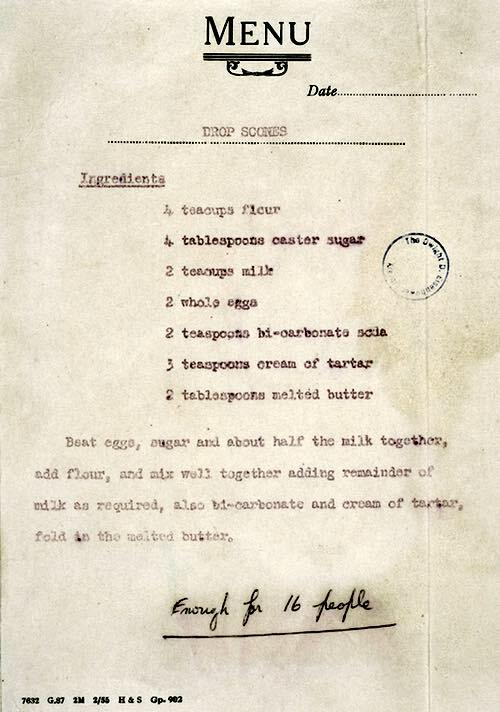 Queen Elizabeth made these tasty pancakes for President Dwight D. Eisenhower during his August 1959 visit to Balmoral Castle in Scotland. 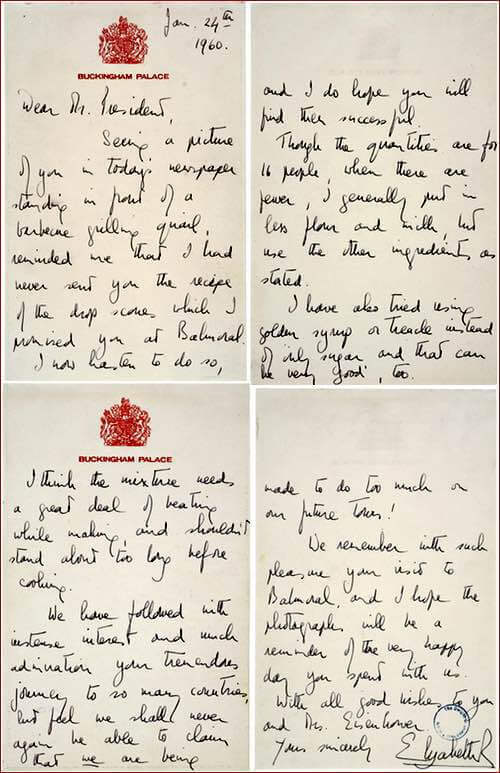 Her Majesty later enclosed a copy of her favorite homemade pancake recipe with a handwritten letter to Eisenhower in January 1960. In the USA use Super Fine sugar, sometimes called Bar Sugar. In Canada use Super Fine or Berry Sugar. These sugars are finely ground versions of granulated sugar, yet they are not powdered like icing sugar. 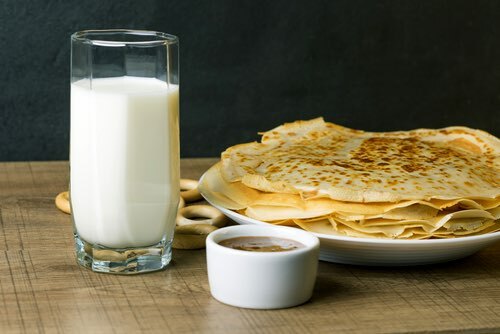 Beat eggs, sugar, and about half the milk together, add flour, and mix well together adding remainder of milk as required, also bicarbonate and cream of tartar, fold in the melted butter. Enough for 16 people. "Though the quantities are for 16 people, when there are fewer, I generally put in less flour and milk, but use the other ingredients as stated. 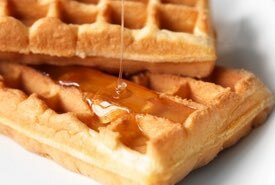 I have also tried using golden syrup or treacle instead of only sugar, and that can be very good too. I think the mixture needs a great deal of beating while making, and shouldn't stand about too long before cooking." You may visit the U.S. National Archives and Records Administration online to view the Queen's original handwritten letter to President Eisenhower.